Colombia is super gay. 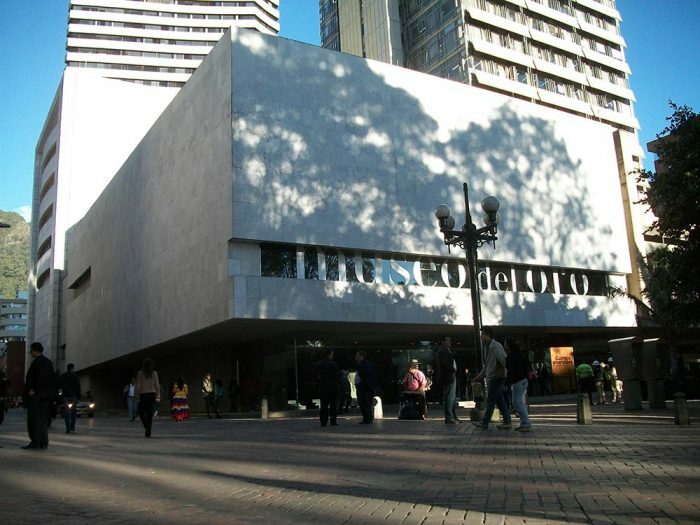 The capital city, Bogotá, is home to the largest gay club/disco in South America, Theatron. Which, at capacity, holds up to 5000 party revelers and has 13 different dance floors. Aside from this enormous club, Bogotá also has a population of 9 million, so the city is vast and has many neighborhoods. Like any major city, certain areas are safer than others. 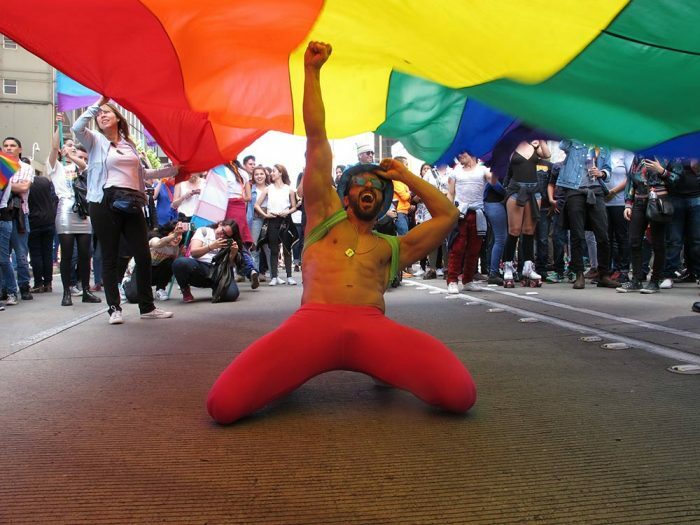 This is our brief guide to Gay Colombia. Colombia is filled with lots of fantastic cities, and beautiful coastlines. But it’s the people themselves that are Colombia’s greatest natural resource. Everywhere you go, you’ll meet locals that smile when they see you, and they really try to make you feel welcome. Bogotá is the capital, and the old town, La Candelaria, is well worth a visit. It’s not a gay neighborhood, but it’s fun and safe. 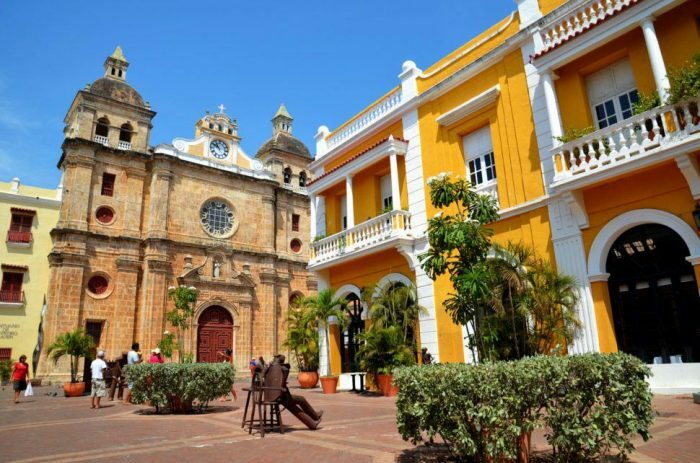 You’ll see some of Colombia’s oldest architecture, and you can grab a bite to eat, visit the Museum of Gold (Museo del Oro), or relax with some friends sipping on local beers; Cerveza Aguila is delicious. You’ll find that the locals are friendly, helpful and sweet. Many Colombians do speak a little English, but if you also speak a little Spanish, it really helps to get the conversation flowing. Chapinero is known throughout Bogotá as the center of the city’s LGBTQ community. So much so, that the neighborhood is often called ‘Chapigay.’ Chapinero is a very affluent district and has some of the best nightlife in the city. Theatron is open to everyone, as a truly inclusive and diverse place. Saturday is their busiest and most exciting night, as all 13 areas are open and usually feature special performers, from drag queens to singers and dancers. Here are some of our top tips outside of Bogotá. Birthplace and final resting place of the nefarious Pablo Escobar, Medellin is a remarkable city. The locals speak the best and clearest Spanish in all of Latin America, many tourists stay here for a month or two just to learn the language. The city has excellent public transport, and an impressive collection of perhaps, South America’s best known artist, Botero. The gay scene has begun to grow here, and it has some nice gay bars and some great clubs playing electro or latino tunes. Medellin is also home to the world’s first legally recognized three-man marriage. This fortress city is one of the oldest parts of the country. It was an important port and retains some of that old world charm to this day. You can walk the city walls and pass through the centuries of time, as you sip on golden rum and listen to the music of the universe glide in from the ocean. It’s a truly ephemeral experience. Cartagena has impressive old city walls, and the yellow stone buildings evoke a Barcelona vibe. The highlight is actually just outside the city walls at the square in front of San Pedro Claver Church. Locals congregate here on warm summer evenings to Zumba and enjoy life together as a community. On an occasional afternoon, a local barber will set up a chair in the square and trim the hair of locals and tourists alike. There are gay parties in Cartagena, and you can find Colombians to fall in love with. 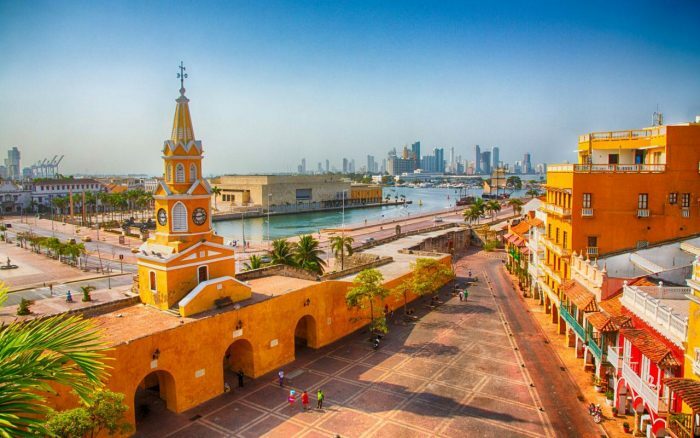 You will be so madly in love with Cartagena, you might not want to share this gorgeous city with anyone else. 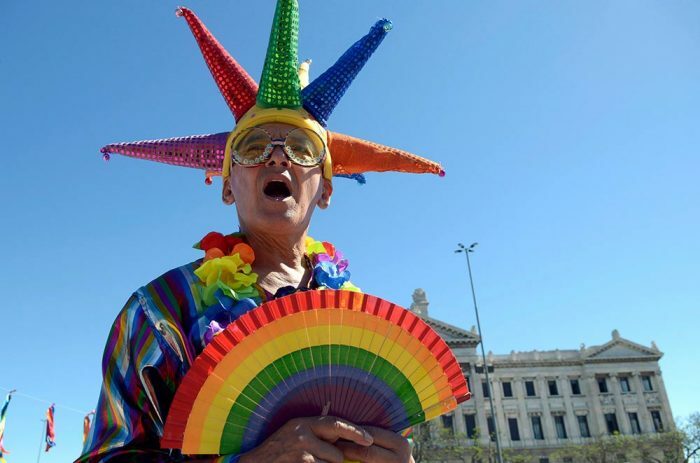 Colombia is a very gay friendly country and safe for gay tourists. Travel always comes with certain risks, and all travelers need to keep their wits about them. Colombia has quite the reputation for being a dangerous country, but the government has worked hard on shaking off its Escobar stains, and they are continually negotiating peaceful practices with FARC. The locals are tired of apologizing for the actions of Pablo Escobar, and just want you and them to get on with the business of living, and leave the dead where they are. With all of that in mind, remember to be careful how much you drift into unknown areas. If possible, get hotels or bars to call you a cab. Don’t just hail one, and don’t go looking for trouble, it will find you very quickly if you do. Lastly, when it comes to brief encounters with hot guys, Colombia has some serious security measures. In most hotels, guests have to be signed in and out; they need to know who is visiting you and why. It’s probably better not to invite guys back to your hotel, but actually take them to a ‘room by the hour’ motel. The experience is quite liberating, and you get to sleep on clean sheets when you get back to your room. Martijn and Dayner are a gay couple who have recently moved back to Colombia and opened their own fetish store, DaleMas. They met in Amsterdam, fell in love and after many years of living and loving in Europe, they decided to take the plunge and relocate to Dayner’s hometown of Bogotá. 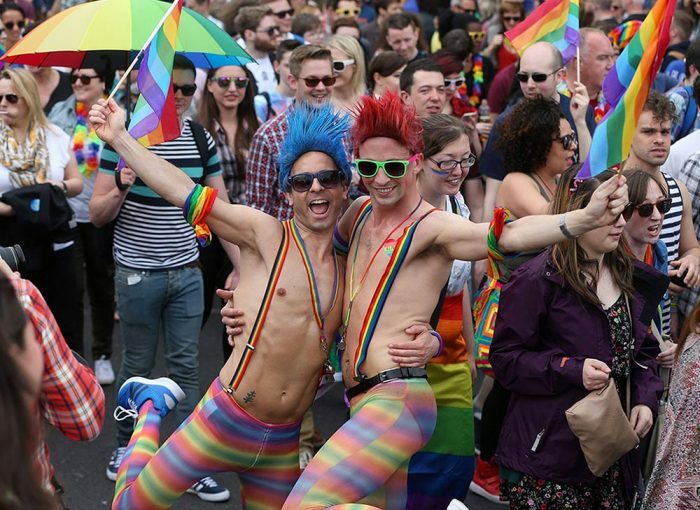 We asked the couple whether Colombia was safe for gay tourists. ROMEO: Is it safe to kiss a boy in public and hold hands on the beach? Martijn and Dayner: Yes, this is no problem. For instance, in Cartegena, there is a gay beach called Hollywood. From a gay point of view, I feel more safe in Bogotá than in Amsterdam. ROMEO: What advice do you have for Romeos who plan to visit Bogotá? Martijn and Dayner: Go and enjoy gay life in Colombia. There are many gay places to see, but please also visit the rest of the country; it is really beautiful. And, if you come to Bogotá be sure to say hello to us in our fetish store. Last year we featured Colombian artist, Carlos Gutiérrez in Queer Careers.